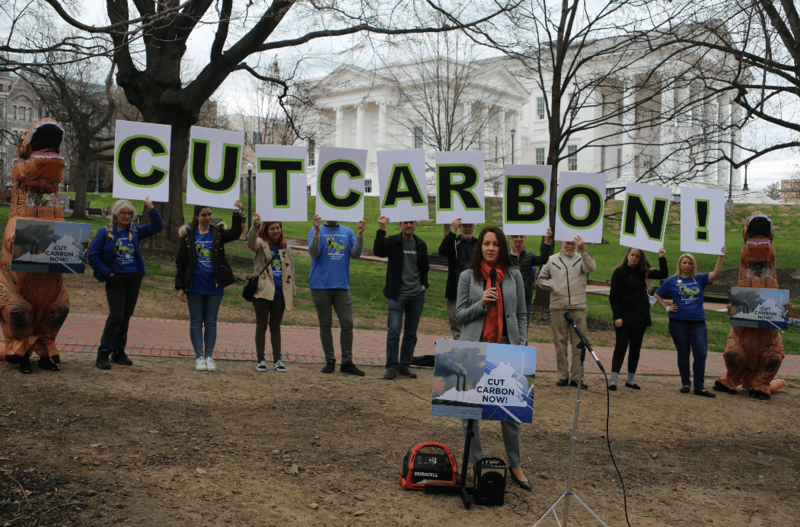 Angela Navarro, deputy secretary of natural resources for Virginia Governor Ralph Northam, speaks in support of the proposed Carbon Reduction Plan on the grounds of the state Capitol. RICHMOND, Va. (CN) – Activists and citizens gathered in the state capitol Monday to support and comment on a proposal to make Virginia the first state in the South to limit carbon emissions and enter a multi-state carbon trading market. The Virginia Carbon Reduction Plan was created after former Governor Terry McAuliffe issued an executive order in May 2017 to assess the impact of climate change on the state. After the study showed a myriad of possible and ongoing hazards, he ordered the Virginia Department of Environmental Quality to develop a plan to address them. The plan, released in the waning days of the McAuliffe administration, includes cutting carbon emissions from coal-fired power plant by 30 percent, and establishing a carbon trading market to work with similar markets to those now in place in the Northeastern United States. On Monday, the state’s Air Pollution Control Board held the last of six scheduled public hearings to gather input from private citizens and advocacy groups. “Action can’t wait and we are excited that we have so much interest in this rule across the Commonwealth,” said Angela Navarro, deputy secretary of Natural Resources for Governor Ralph Northam. Speaking at a Sierra Club-sponsored event ahead of Monday’s hearing, Navarro said climate change was a “key strategic issue” for the governor and that he felt action couldn’t not be put on hold. The McAuliffe-era report said 420,000 families and some military bases located along the Virginia coast could be impacted by rising storm surges and flooding, and projected that if the worst case scenario came to pass, $92 billion would be spent to cover reconstruction costs. “These regulations are critically important,” said Glen Besa, a Richmond resident who suggested the growing demand for energy would lead to increased emissions if the plan doesn’t go into effect. “This might not get us where we need to be, but it’s a good first step,” he said. Not everyone in attendance was of like mind. Kline suggested that if the plan goes forward, the state should maintain an exemption for industrial boilers and recognize biogenic carbon dioxide emissions, or emissions from non-fossil fuel sources like wood, as carbon neutral. “The regulation is intended to reduce emissions from fossil fuel-fired plants but it would also apply to biomass utilities” she said. John McGruder, a member of the Three Rivers Forestry consulting firm based in rural Tappahannock, Virginia, manages about 75,000 acres of forest land for 450 land owners. His group harvests low-quality timber for a number of uses, including biogenic fuels, as well as replants forests to replace the supply. “The materials made from the thinning processes are often used in boilers to produce steam to power the forest product industry,” he said. “Biogenic carbon dioxide emissions should be counted as making zero contributions in the atmosphere where forest stocks are stable or increasing,” he said. Still, environmental advocates praised the plan on the whole. Kate Addleson, director of Sierra Club’s Virginia Chapter, equated the plan to drawing a line in the sand against the fossil fuel industry. Rob Richardson, a spokesperson for the state’s largest energy provider, Dominion Energy, also weighed in on the plan. He said his company had already worked to reduce emissions and invest more in renewable sources, like solar.